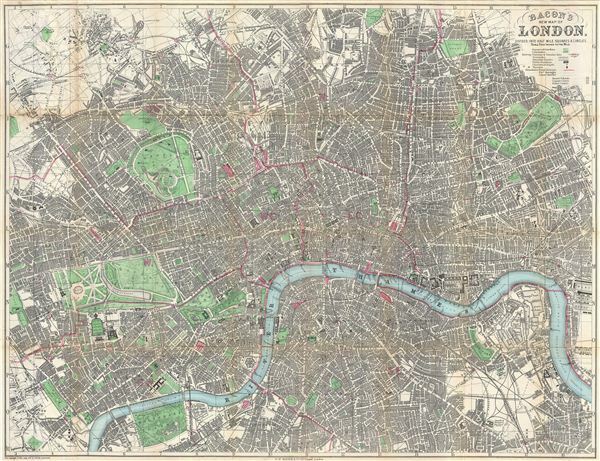 The first edition of one of the best known maps of Victorian London. Bacon's New Map of London, Divided into Half Mile Squares & Circles. A scarce 1876 first edition map of London by G. W. Bacon. Centered on the Thames River, the map covers from Hampstead to the West India Docks and from Camberwell to Notting Hill. It is divided into both a grid of 1/2 mile squares, which are numerically identified at the border, and 1/2 mile circles from Charing Cross. Various parks, including Hyde Park, Kensington Gardens, Green Park, St. James Park, Battersea Park, Regents Park, and Victoria Park, among others, are shown in beautiful detail. All streets, important buildings, neighborhoods, rail lines, and bridges are identified. Postal districts are highlighted in light red. Immense. The richest town in the world, the biggest port, the greatest manufacturing town, the Imperial city, the center of civilization, the heart of the world. Nonetheless, it was not a city without problems. The 19th century population explosion led to sanitation problems, crime, overcrowding, ethnic discrimination, poverty, and a host of related issues - many of which became the subjects of popular Charles Dickens novels. At the same time, these very issues contributed to the development of philanthropy, urban social reform, and contemporary mass transit making London the world's first truly modern metropolis. George Washington Bacon (1830 - 1922) was a London based book and map publisher active in the mid to late 19th century. Bacon's firm G.W. Bacon and Co. purchased the plates created by Edward Weller for the Weekly Dispatch Atlas then modified and updated them for several of their own important atlases, including The New Ordnance Atlas of the British Isles. In 1893, Bacon & Co. acquired the map publishing business of J. Wyld. Then, around the turn of the century, Bacon & Co. itself was folded into the Scottish publishing house of W.& A.K. Johnston. Very good. Professionally flattened and backed on archival tissue. Hyde, Ralph, Printed Maps of Victorian London, 1851 - 1900, no. 160-A-1.